Blossom end rot, often called "tomato dry rot," afflicts gardeners worldwide. A dry, brown spot develops at the end of a ripening tomato where the tomato blossom had formed and fallen away. In that area, tissues are breaking down due to a lack of the calcium needed for cell formation. There are a handful of reasons why a tomato plant might be getting insufficient calcium, and a corresponding handful of effective prevention strategies. Damaged roots or a sudden period of drought can lead to restricted water intake. This leads in turn to a reduction in the transportation of all nutrients, calcium among them. Over-watering your tomatoes can be just as bad. Heavy rain, over-irrigation or high relative humidity can also lead to calcium deficiency. To prevent damaging roots and thus reducing water intake, avoid cultivating the soil too close to your plants. 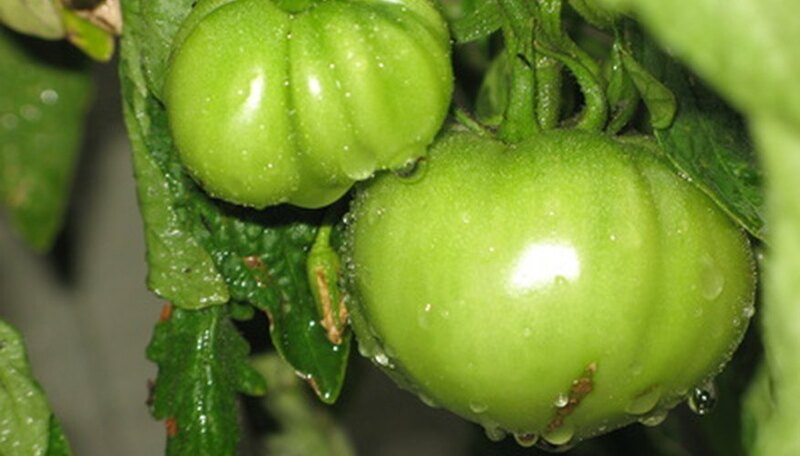 Plant tomatoes in warm, well-drained, well-aerated soil to ensure good root development. Mulching your plants can help prevent blossom-end rot (BER). A good layer of mulch made up of straw, pine straw, decomposed sawdust, newspapers or even plastic will help conserve moisture. Meanwhile, ensure your plants receive about 1 1/2 inches of water per week while they are fruiting. Keeping the watering rate consistent will go a long way in preventing BER. Soil with a pH that's too low can lead to your tomato plant getting too little calcium. To prevent overly acidic conditions, perform a soil test and apply lime at the recommended rate to raise the pH to the 6.0 to 6.5 range. Do this two to four months before you plant. A very simple reason tomatoes don't get enough calcium is a lack of calcium in the soil. A simple fix is to perform soil tests and apply fertilizer as needed. If BER develops, you may be able to mitigate conditions with a foliar spray of calcium solution. Mix 4 level tbsp.of calcium chloride or calcium nitrate into a gallon of water, and spray two or three times per week once the second fruit clusters are blooming. If daytime temperatures are above 85 to 90 degrees Fahrenheit, use calcium nitrate; calcium chloride will burn plants under high temperature conditions. Apply only as much fertilizer as soil tests indicate is needed. If you apply too much, that, too, can cause BER.